The sport of wheelchair basketball was invented in the early 1940’s. As a result of the World War II, many war veterans were left with a physical disability. Many sports were being adapted at that time so they could be used as a means for rehabilitation and therapy for these injured war veterans. Basketball was seen as one of the most adaptable team sports and thus the sport of wheelchair basketball was born. Wheelchair basketball is played on a standard sized basketball court. The height of the basket, the distance to the foul line, three point line, etc. are all the same as in the game of stand up basketball. Dribbling: If the ball is placed on the lap, a player may only take two pushes, they are then obligated to shoot, pass or dribble the ball. There is no double dribble rule in wheelchair basketball. Travelling: A traveling violation will occur if the player takes more than two pushes while in possession of the ball without dribbling. Personal Advantage Foul: A player lifting their legs or lifting out of their chair to gain an advantage will be given a technical foul. A player must remain firmly seated in their chair at all times. In Canada, Wheelchair Basketball Canada governs the sport. For more information on the sport of wheelchair basketball, visit the Wheelchair Basketball Canada website at www.wheelchairbasketball.ca. 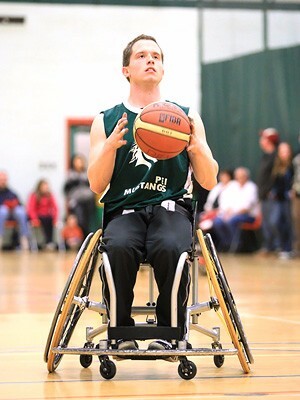 The PEI Mustangs is a competitive wheelchair basketball program that is part of the Maritime Wheelchair Basketball League. The team practices two/week throughout the months of September to April. The team competes in 5-6 tournaments a season, both off and on Island. If you are interested in the sport of wheelchair basketball, please contact the ParaSport and Recreation office for more information or drop by one of the practices to give it try! Practices begin the week of September 10-16th, 2018. Registration is $30.00 + Off-Island Tournament Fees. To register, please contact the ParaSport and Recreation PEI office. The Jr. Wheelchair Basketball Program is designed to introduce school aged youth (ages 7-16) to the basic fundamentals of wheelchair basketball. It will also teach some of the basic fundamental movement skills of all sports. Fundamental movement skills are very important in the physical development of a child. When a child learns these specific skills it is easier for them to develop more complex movement skills that allow them to enjoy sport and physical activity. Most importantly, we want children to get active while having fun! If you have a child that might be interested in wheelchair basketball, please contact us! Start Date and Time is TBA. For additional information, please contact the ParaSport and Recreation PEI office.